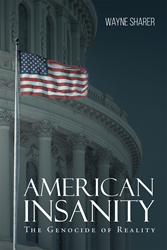 Author Wayne Sharer’s new book “American Insanity: The Genocide of Reality” is an eye opening look at the sophisticated operators destroying American society. Recent release “American Insanity: The Genocide of Reality” from Page Publishing author Wayne Sharer exposes the insanity overtaking America through the deceptive politics of both parties, the lies and truths from the media about science, the Constitution, and the genocide from the Middle East. Wayne Sharer, a retired Commander of the US Navy, has completed his new book “American Insanity: The Genocide of Reality”: a captivating and terrifying look at the absolute nonsense the political class has created to have the American public turning a blind eye to the real global catastrophe. Published by New York City-based Page Publishing, Wayne Sharer’s engrossing look at political correctness, judicial equality, marriage equality, gender rights, global warming, racial issues real or fabricated, will hopefully shed some light on the real and true issues. Sophisticated operators in both parties use tactics once only found in regimes like the Nazis, the Soviet Union and Mao’s China to divide the nation and drive the American public to misguided decisions that destroy the roots of American society. Delivering a false American history, presented without the truth, these decisions will be the death of America as we know it. Delivered with a unique, nothing-held-back diction, Wayne Sharer documents the real facts and history behind the issues being twisted to create the insanity of growing hate and divisiveness in society. Readers who wish to experience this staggering work can purchase“American Insanity: The Genocide of Reality” at bookstores everywhere, or online at the Apple iTunes store, Amazon, Google Play or Barnes and Noble.